As the marketing arm of Windsor Court Hotel, we continuously research contemporary trends in social media content and develop relationships with local and regional media. Whether through designing the annual holiday card or running social media contests, DEVENEY actively works to increase engagement and evolve this luxury brand. Goal: Expand Windsor Court’s social media reach and showcase hotel events and dining outlets as engaging, exceptional places that offer elevated experiences. Objective 1: Identify five definable guest moments that are a combination of local and branded events. Objective 2: Develop social media content focused around definable guest moments that encourage sharing to achieve a reach of 10,000 social media users in 2017. Objective 3: Partner with four influencers to execute takeovers that showcase food and beverage, property and elevated local experiences. Objective 4: Achieve an organic social media reach of 25,000 through influencer partnerships in 2017. With the aim of enticing a younger demographic, DEVENEY’s market research identified the trend of millennials’ focus on travel experiences, with 86 percent of millennial travelers listing “experiencing a new culture” as an incentive for travel. This direction guided our team to refine the broader goal of “showcasing hotel events and dining outlets” into identifying smaller, definable moments that could be highlighted. From there, we reflected on Windsor Court’s event schedules from years past and established the objective of five definable moments. Platform analyses was conducted to achieve our objective of shareable content surrounding these definable moments. Initially, we were leaning toward Instagram, but after reviewing 2016 metrics, we determined that Windsor Court’s followers participated in the more passive “like” of photos rather than meaningful shares or “regrams.” Therefore, Instagram would not achieve our objective of reaching 10,000 users through shares in one year. Based on the identified target audience, we determined that Snapchat would be the best channel to achieve this objective. The platform’s primary use is for the active sharing of content to friends and followers with a lessened emphasis on passive scrolling. Additionally, the platform’s latest demographics show that 71 percent of Snapchat users are under 34 years old. With the selection of Snapchat, our team decided to focus on Geofilters, noting the prohibitive amount of time needed to regularly post account content. DEVENEY worked to create a Geofilter content schedule targeting key touchpoints for food and beverage. The selected events provided ample opportunity for user-generated content from guests. In addition to identifying events, we utilized Windsor Court’s reservation numbers to guide the times selected for the filters to run. Prohibition Tea – A speakeasy-style afternoon tea that draws a younger crowd with its Gatsby décor and costumes. LGBTea – An afternoon tea during New Orleans’ famous Labor Day LGBT celebration, Decadence. This inaugural event featured bottomless mimosas and drag queen performances, appealing to audiences outside the typical tea attendees. New Orleans Saints vs. New England Patriots football game – Located less than a mile from the Mercedes-Benz Superdome, Windsor Court’s Polo Club Lounge was the ideal location for post-game food and beverage for locals and guests traveling for the game. Initially, this was the only non-property event identified in our touchpoints. Halloween Tea – Costumes were encouraged for this tea that featured specialty, holiday-themed treats and motivated attendees to capture their own photography. Windsor Wishes – This holiday afternoon tea at Windsor Court was a family affair, with reservations made months in advance. The majesty of the property’s décor is frequently photographed during the festive time of year. Geofilter design proved to be challenging, as we needed to balance Windsor Court’s traditional visual aesthetic and Snapchat’s casual style. We solved this by focusing on the Windsor Court brand guidelines, limiting the number of fonts used in the design and avoiding trendy imagery or colors. However, we knew limiting our efforts to one platform would be a disservice to our client. We planned to incorporate new offers and exciting opportunities into our organic social content on all existing social media platforms, and we sought opportunities to expand our reach through influencer partnerships. When considering platforms to showcase partnerships, Instagram was an obvious choice since our existing audience aligned with the target audience. 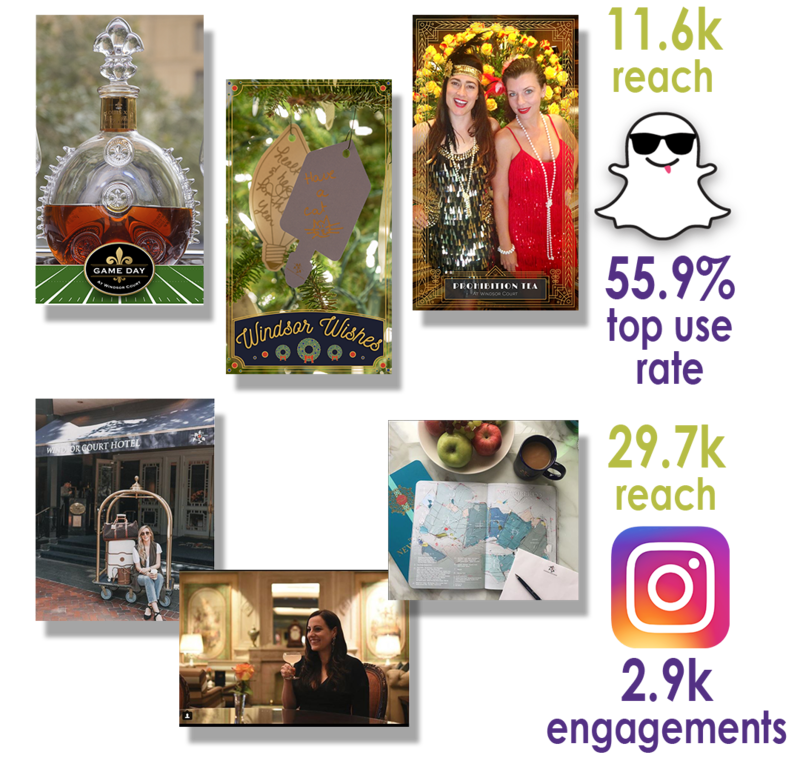 The platform’s visual storytelling capabilities allowed influencers to creatively showcase the unique culture of New Orleans and Windsor Court’s luxury accommodations. Because of Windsor Court’s prestige, DEVENEY quickly identified the need to develop an evaluation system for proposed opportunities. The evaluations included a review of influencers’ accounts for meaningful follower engagement and overall visual aesthetic. In exchange for accommodations and various amenities, we requested that the influencers provide a series of content from their stay. We found that our identified influencers were more agreeable to “Instagram takeovers” versus inundating their own feeds. For content to truly feel authentic, we worked closely with influencers to coordinate featured experiences. Krystal Faircloth of @apinchoflovely – Of all our partnerships, Krystal’s style best mirrored the Windsor Court aesthetic. Her content focused on a ‘staycation’ theme and luxury travel. Natalie Migliarini of @BeautifulBooze – Natalie’s content focused heavily on food and beverage, similar to her regular account content. This partnership was executed during Tales of the Cocktail, an international spirits event hosted in the city. The Scout Guide of @tsgneworleans – A local branch of a national organization, The Scout Guide team focused on the elevated New Orleans experiences that Windsor Court guests seek. Hank the Pig of @MyBestFriendHank – DEVENEY’s research identified a national correlation between affluence and the desire to travel with pets. Our Hank partnership aimed to raise awareness of the property’s pet-friendly amenities while tying into the adorable mini pig’s rising popularity. DEVENEY far exceeded the objectives set forth and the goal of expanding Windsor Court’s social media reach and showcasing the hotel events and dining outlets as engaging, exceptional places that offer elevated experiences. Results: DEVENEY identified six key touchpoints that were a combination of property events and local or national events. After seeing the impressive results from the New Orleans Saints vs. New England Patriots Geofilter, DEVENEY added a seventh Geofilter for New Year’s Eve to showcase national events celebrated on the property. Those two filters alone received some of the highest Snapchat views. Results: Snapchat proved an excellent platform for communicating our message. From just over 300 Geofilter uses, we met and exceeded our objective by reaching 11,595 Snapchat users. Results: Through a combination of research and networking, DEVENEY engaged four local and national influencers. Each of these partnerships captured a unique aspect of the Windsor Court experience, including property, food and beverage, local experiences and pet-friendly travel. Results: DEVENEY’s influencer partnerships resulted in 25 pieces of content with a combined organic reach of 29,768. More importantly, these partnerships generated unique, engaging perspectives of the Windsor Court experience with over 2,900 comments, likes and saves.